EWDD staff referred Oksana Putyatina to the Hollywood BusinessSource Center, which helped her attain a $3,000 working capital loan to expand her business. 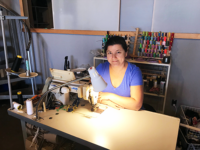 Oksana is the owner of “RadSeams,” a clothing company that makes art installations, costumes, custom clothing, bags and provides small run production for local designers in the City of Los Angeles. Oksana started her company 3 years ago with a passion to create a platform for her clients to make their vision come true in a professional, organized and insured environment. Oksana started out as a seamstress when she first immigrated to the United States in the 1990s. EWDD referred Oksana to the Hollywood BusinessSource Center in February 2018. She was looking to obtain a working capital loan to purchase a sewing machine and hire high grade production sewers to take on more production work. Oksana knew that this was the first step to building a strong and sustainable financial backbone for her business. A Hollywood BusinessSource Consultant met Oksana at her working studio and introduced Kiva Crowdfunding to her. The Hollywood BusinessSource Center endorsed Oksana for a $3,000 Kiva loan which was approved in March of 2018. Oksana said she is very grateful that she will be able to take on more projects and contracts from her clients, thanks to the help she received from the Hollywood BusinessSource Center.